Relentless! Not just the daily practice of speaking tests, writing tests, any grammar/YouTube stuff I can get my hands on, but this all while I have a full time job and am doing a MSc in Blended and Online Learning. This past week was particularly busy: I did my UCLAN Intermediate Russian Writing and Speaking tests early as I will be away during exam week. I was Ok on the speaking – I managed to improvise a conversation in a restaurant, and appreciated it as a “trial run” for the трки exam on 18/19 April. I also did my presentation for the Master’s – on gamification – just the dissertation left to do, in the evenings in St Petersburg. Now I am off to Glasgow for Mootieuk18 and anticipate having hardly any time to practise Russian. Unless I bump into a Russian speaker – Поживем увидим! So today I went with my son to the languages centre at St Petersburg university to sign up for our respective exams (mine being the A2 Basic Level) It was an interesting experience for me. We went up some stairs into a general entrance hall – didn’t see any obvious signs, so my son asked the receptionist and we were directed up another flight of stairs to a room with three people just quietly getting on with stuff… the young woman at the desk nearest the door looked up, didn’t smile or say anything so my son explained we wanted to sign up for exams. She then continued doing what she was doing and then after a while asked for our passports, asked when we wanted to take the exam, printed off some papers for us to sign and told us we had to go and pay at a bank – it couldn’t be done there. Efficient, minimal bureacracy, but no smiles, no encouragement. But that’s fine -different cultures. So we turn up for 10 am on the Wednesday for the grammar, reading and writing tests and then at a different set time on the Thursday for the speaking and writing tests. So that’s it! Booked and paid for! No turning back! getting frustrated at all the things I can’t say, forget, get wrong and generally don’t do successfully. Unfortunately, as a linguist and a language teacher, I’m already aware of how much I still have left to learn, and rather than focusing on my successes, I’m getting my head in a spin about my failures. It happens each time I have my private lesson with Lilya on Monday. They are excellent lessons because my brain is forced to function right up to its highest limit (and sometimes even beyond) There is only me in the class – I can’t hide! I have to answer every question, and having the brain of a 58 year old is no excuse. But I come out of the lessons – having spoken Russian for a hour and a half – tormenting myself for missing off a soft sign in my homework, using the accusative when I should have used the dative when I actually knew that, forgetting , when put on the spot, the prepositional plural adjective ending.. I must be rubbish 🙁 What am I thinking of, planning to take an exam in April? I wish I could praise myself a bit more. (Oh, Lilya praises me – that’s not the issue – I don’t praise myself) It is now 15 months since I began studying Russian in earnest (in “anger” as my developer colleagues would say!) In terms of grammar, I sail through A2 level exercises and even tackled a B1 grammar test the other day, getting 97/100. I could walk a GCSE Russian (I know; I did the past papers) and I could happily have a long conversation with you (or even give you an off the cuff ten minute talk) about various aspects of my life, family and career. I know – I’ve done all of those too. I remember the young me, top of the class in languages and finding the work very easy. But I forget it took me about three years to get to the level I am at in Russian after 18 months. I forget I never had high level private lessons that stretch me to the limits of my abilities. I never had to struggle. And I think to myself…. 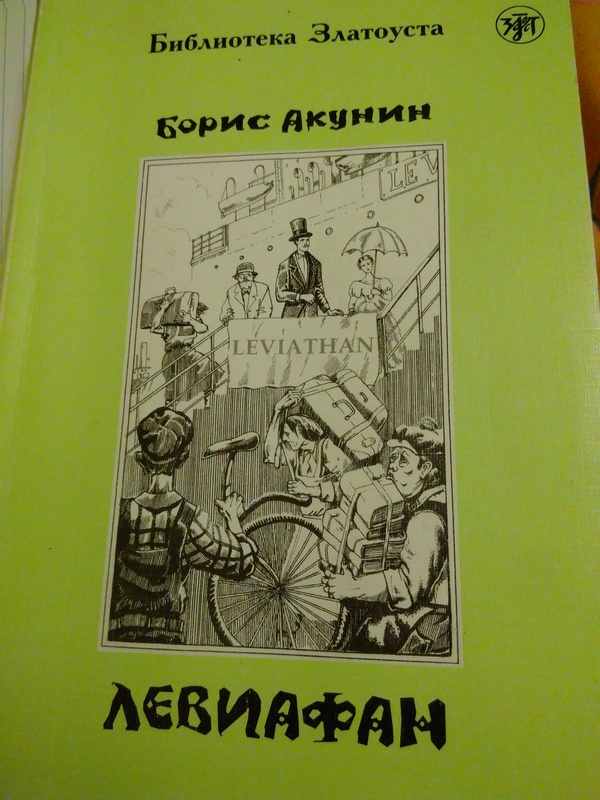 if only I were learning Dutch or Italian, or Portuguese… I’d be of a far higher standard than I am now in Russian. Of course, but these languages (to me with my past experiences) are much easier to manage; it’s not right to put them on the same step as Russian. And worrying about #uksnow. Will it affect my imminent journey to St Petersburg on Thursday? practising the Imperative. That’s the second person, the first person plural and the third person. 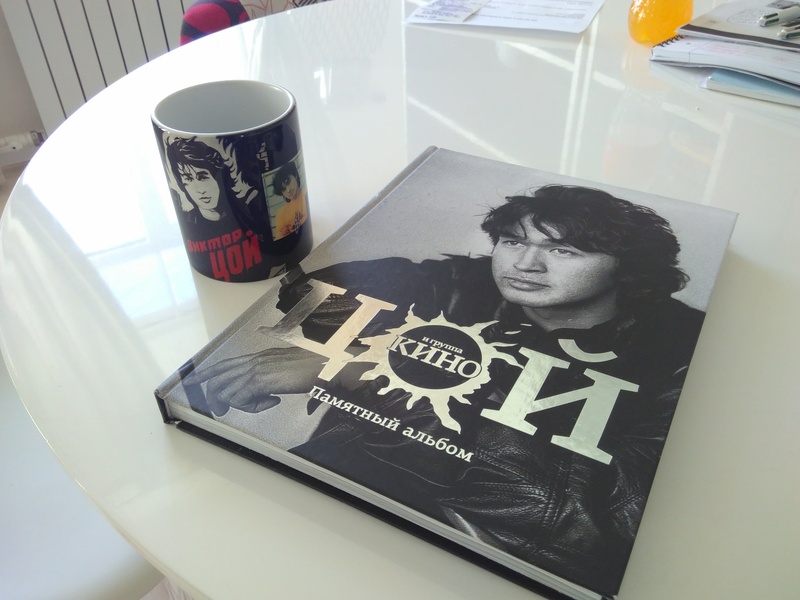 My teacher told me about the song Пусть всегда будет солнце ,the whole refrain of which is third person imperative. Did I mention I was getting into a panic about an exam? We’ve just finished the latest run of the Learn Moodle MOOC and as usual thousands of participants from around the world joined in, in their quest for a certificate of completion proving they know the basics of teaching with Moodle. Perfect timing, since it fits in with the plans for the Big Adventure. I’m all booked up now for three weeks in St Petersburg in April. I’ll be attending the ITMO during the first week, working as normal, studying and absorbing Russian during the second week and taking the Basic Level exam (registration permitting) during the third week. I’ve told the cat I am not coming home until I can speak fluent Russian – although since my return flight is booked for 24 April, I might have to qualify that statement somewhat.. Deep breaths: I’m looking forward to the conference and I am grateful that my Moodle job allows me to work from anywhere in the world. However, I do catch myself every now and then thinking “What on earth have I let myself in for?” Three weeks on my own in a country whose language I only started learning last year, where many of the locals struggle with English… the vanity of taking an exam that I don’t need to do, won’t get any professional benefit from and will stress about for another two months..
I’ve been trying to remember how I memorised vocabulary when learning languages at school. We were given little blue vocabulary books and were tested on them. I only recall this in the early years though – in later years , the words just seemed to ‘stick’ the first time I encountered them. I’m still in the initial stages of learning a language though, and that’s not going to happen for some time yet. I tried writing down new words from each lesson, doing the ‘look/say/cover/say/check’ method, but it gets tedious at times. I started a little notebook with the aim of adding new vocabulary in alphabetical order but that wasn’t successful. You just don’t learn languages in alphabetical order. I will sometimes learn lists of words on a topic -the current one is parts of the body and illnesses. That has more meaning, but what I am missing is the useful phrases that occur at random in conversations and texts – the ones you might not necessarily be given to memorise in lessons. 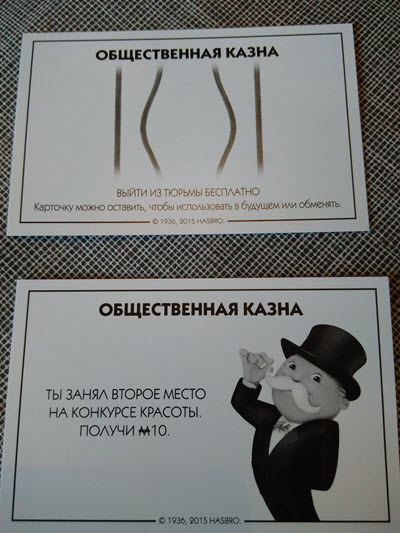 I’ve got a bundle and each time I encounter a word or phrase I want to learn, I put the Russian on one side ad the English on the other side. Then every now and then I can test myself simply by flipping through the book looking only at one language and trying to retrieve the other language. 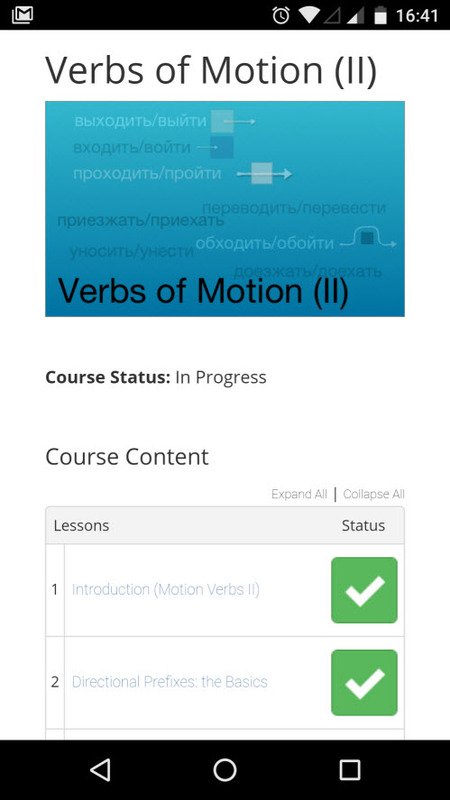 This has the advantages of (a) being a quick, easy way to note down new vocab as I go along learning Russian and (b) not mattering what topic or letter of the alphabet it is and (c) adding a modicum of gamification to the learning. (For me, I think (a) is the most convincing reason! 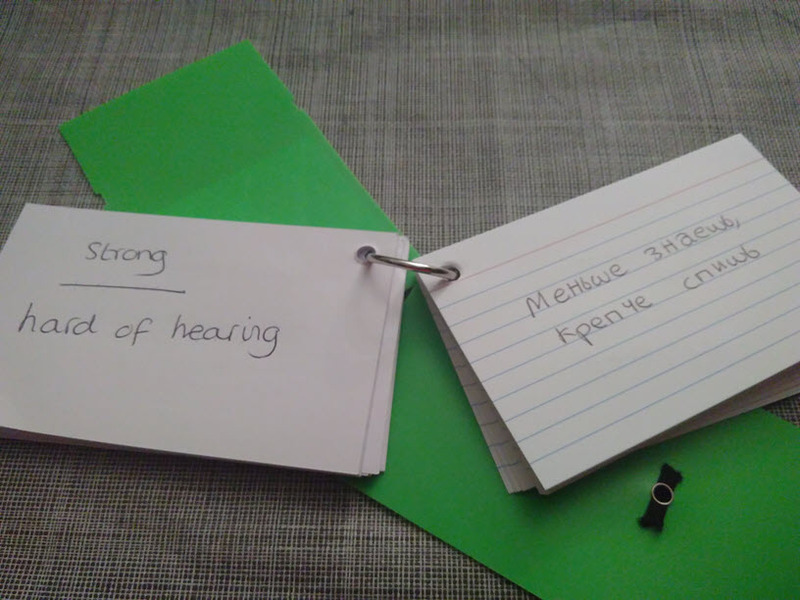 There’s also a (d) – the little book of index cards is handy to carry around and if I make a mistake, I can rip one out without spoiling the rest of a page. In the midst of facilitating our twice-yearly Learn Moodle Basics MOOC, I am persevering in my quest to prepare for the Basic Level TORFL exam. I’ve decided the dates; I just need to book the flight. I have to say though, I prefer to do all my learning on a computer or laptop! So the course works in a very straightforward way: you watch some of the good doctor’s excellent videos (some from YouTube but many, as I understand it, new for this site) and you are then tested on your understanding. Every now and then on the Moodle.org forums we get people asking how they can make sure students have watched their videos all the way through (and not just put them on, gone out for coffee and returned later.) The response is – you can’t – but you can include questions from certain key points, either during the video or afterwards, which they can only answer if they have absorbed the materials. 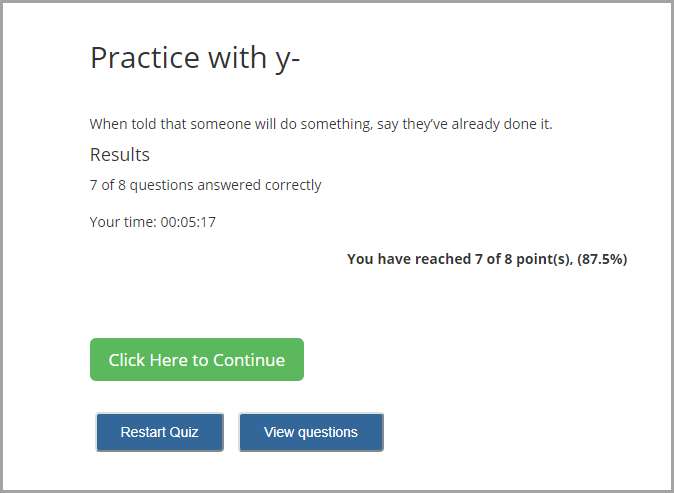 The comprehension check does this, as do the mini-quizzes after the videos. Another aspect of the course is the audio reviews. Here you are told (in English) to say certain phrases, a pause is left for you to do so and then the correct answer is repeated in Russian by a native speaker. Nothing fancy, no gimmicks – just plain, accurate translation. Love it. I chanced upon this blog post: Top 3 worst tips for learning Russian, courtesy of a tweet from tips4russian, and it reminded me about all this hype about learning a language like a child, only speaking the language, immersing yourself in the language… sorry but no. Understand the structures, translate from your own language, practise and memorise – and then you’ll learn. And again, although we don’t have a live teacher, we are made to generate the language, this time by saying instead of writing. It’s that retrieval thing I blogged about last year – very effective. 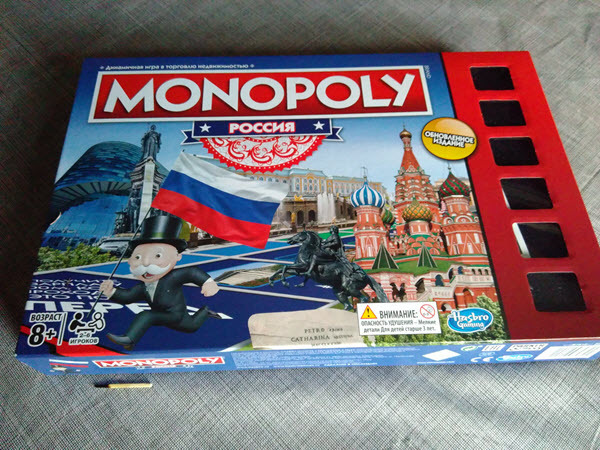 No – this isn’t some in-depth commentary about Russian political schemings – it’s that other Monopoly -the game – which my son bought me for Christmas. It’s a good way of practising a foreign language with something you are already familiar. It’s particularly useful with counting and dealing with money. For someone whose geography of Russia extends only to St Petersburg and Vladivostok (the latter purely because I saw it on the map whilst flying to Japan once) the game is also a handy intro to Russian cities. I’ve also picked up quite a few helpful phrases – although I’m not so sure how often I might need to “get out of jail free”, but if I do, I’ll know what to say! Maybe I will come second in another beauty contest- I certainly understood that one! Do we really need dictionaries? I was pondering this the other day as I did my Russian homework. 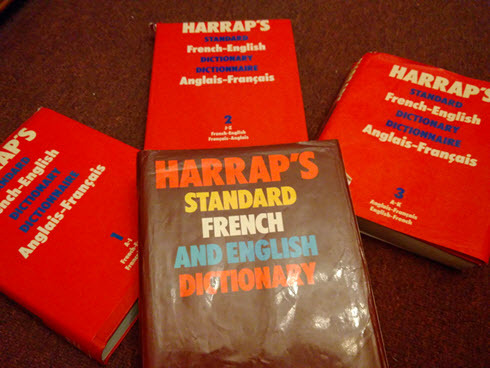 As a student studying French I pored over my four volume Harrap’s Standard French and English dictionary and when I began studying Russian “in anger” (that’s a phrase I picked up from the Moodle developers I hang out with) I bought the big Oxford Russian dictionary. But I hardly ever use it. Why not? First, because it is so much easier to check things using Google Translate on my phone. And before everyone screams in horror: I never take its pronouncements as Gospel. If I need to know a short phrase or correct declension/conjugation, I will often speak into my phone, look at what Google Translate offers and then reverse the process by saying the Russian to discover the resultant English translation. Then if I am still not convinced, I will look at some of the alternative translations on offer, and most useful of all, I will type the phrase into a site such as Reverso which offers real life contextual examples. This final benefit is, I think, the main reason I have moved away from using dictionaries. While it is easy to find single words or verbs with a quick check online, that’s not helpful in isolation. We need to see the words in situations to be sure we’re using them appropriately. Good dictionaries offer examples, but they can’t compete with the internet. Sometimes if I am still uncertain about a phrase, having run it through Google Translate, reverso and the WWW in general, I’ll revert to my dictionary, but interestingly the last time I did that and went with the advice of the dictionary, I ended up with a not-quite-right sentence. The internet had been right after all. In terms of verbs, at the level I am at so far, my 501 Russian verbs book serves me much better than a dictionary because not only does it give me all the conjugations with some useful related expressions, but you can find words more quickly because you don’t have to sift through nouns, adjectives and other extraneous words!! I see that in a couple of the exams I plan to be taking next year, you are allowed to use a dictionary. I presume that will be a paper dictionary, avoiding the distractions and potential misdoings of an online equivalent. I will need to practise a bit with this “old-fashioned” dictionary because one downside of using the internet for word-searching is that you don’t have to memorise the order of the letters in the alphabet! I used to be lightning fast finding words in dictionaries (Ok my known languages had alphabets almost the same as the English one) but on the rare occasions now I use my Oxford Russian dictionary, it takes me a while to remember whether to look near the start of the alphabet, the middle or the end. And how many times have I done a fruitless search for a word under в only to realise it is actually under б? I am not at the stage yet in Russian where I would ask on the (rather scary) Wordreference.com forums, as I have done when preparing presentations or training sessions in French or German, but if when that day does come, that will be yet another reason to forego the dictionary. Perhaps if we’re somewhere with no internet access, when my phone and laptop batteries are dead, perhaps then I’ll need my dictionary? Apart from that.. well.. I’m not convinced..